Michael Flynn brought out a Sir Alex Ferguson-style hairdryer at half-time during Newport County’s 1-0 League Two home win against Cheltenham Town. “The first-half was one of the worst games of football I’ve ever seen,” said Flynn. “We were terrible, nowhere near, sloppy in possession, weren’t brave in possession because nobody wanted it. Even when they did have it the ball was given away. “We were beaten in the air, kicking balls out of play with no thought process. It was awful. “I don’t want to be associated with that and I told them that at half-time in no uncertain terms. Wayne Hatswell made it clear we weren’t having that. 🗣️ POST-MATCH | Manager Michael Flynn was certainly in a jovial mood after seeing his side defeat @CTFCofficial. County took all three points thanks to an own goal after 54 minutes, although Padraig Amond did claim it after the final whistle. Flynn cleared up the confusion, saying: “It was an own goal, but it was forced by some good play by Podge (Amond) and Ade (Azeez) following it in. They put Cheltenham’s Chris Hussey under pressure. The winner came when Cheltenham goalkeeper Scott Flinders made a great save to deny an Amond lob, but he could only palm the ball onto Hussey’s face and into the net. Newport were much improved after their half-time dressing down and Azeez, signed from Cambridge United in January, told iFollow Newport: “Sometimes football is like that. I don’t really know what it was, but we really didn’t start well. “We knew that as players, tried to get each other going and it maybe took until the gaffer and Hats gave us a rocket at half-time to perform better. “We proved that we want to play for this club, proved we wanted to fight for the club and the fans as well. “The gaffer let us know, he’ll never hold back and neither does Hats. It did help us. “We went back out as a team and wanted to prove to them, the fans and ourselves that we could get the three points. “I wouldn’t say it was two bad cops because it worked. It shouldn’t take that to get us going but it worked, and I feel like it helped us. “Overall, it was a great win. A tough first half when maybe didn’t play our best football, but we dug in there and upped it a fraction for the second half. Flynn made one change to the team that started at Northampton Town. 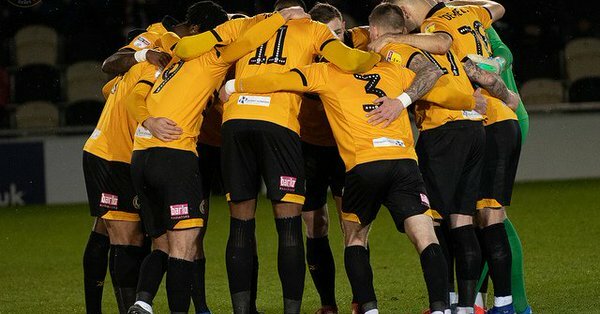 Joss Labadie missed out with soreness to the back and Achilles areas, meaning Azeez returned to the starting side as the Exiles still kept to their 3-4-1-2 formation at Rodney Parade. Former Exile Ben Tozer was Cheltenham captain, while former County and Merthyr Town player Cameron Pring was among the substitutes and Newport-born Ryan Broom played at right-wing-back. Newport sent on substitutes David Pipe and Josh Sheehan for the second half with Mark O’Brien and Tyreeq Bakinson going off. The own goal winner lifted home fans in the 3,000-plus attendance and County now take a break from League Two action. Their scheduled match against Oldham Athletic has been postponed because the Latics have had four players including both goalkeepers called up for international duty. Newport’s next match is against Yeovil Town away on Saturday, March 30.